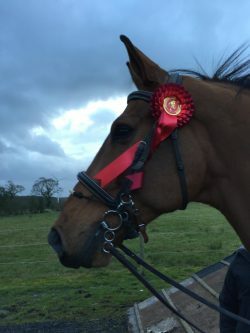 Well last day of 2017 and Cadillac was on winning form taking the 1.20 at Greenlands equestrian and with 4 shows jumped in 2018 we’ve carried on with winning form with Arland H winning 9 classes so far which is just fab. I’m also looking forward to receiving a couple of reserve champions at our local BSJA ball in February where Cadillac has finished 2nd in the 1.20 open points and New to The Job was 2nd in the British novice points, so a small bit of partying might occur. With 2018 I’ve set my sights on lots of things and will more than likely be heading to Hickstead again as well as a few other big ones. I’ve a few more horses to concentrate on as well and I’m looking forward and excited to have them. I was also invited to join the horslyx team at the recent Beta trade fair at the NEC Birmingham where I got to meet my cardboard cut out on the horslyx stand which was a bit of an unreal moment. I met some lovely people and it was very plain to see where everyone’s parts were played amongst the horslyx team to insure a great customer service and basically it showed how as a company it’s growing bigger and better every year!